The confession by Mario Draghi that growth in the Euro-zone may be on the wane comes as little surprise to us who have watched the area struggle for over a decade. Recently Draghi warned, "we can't declare victory over inflation yet." 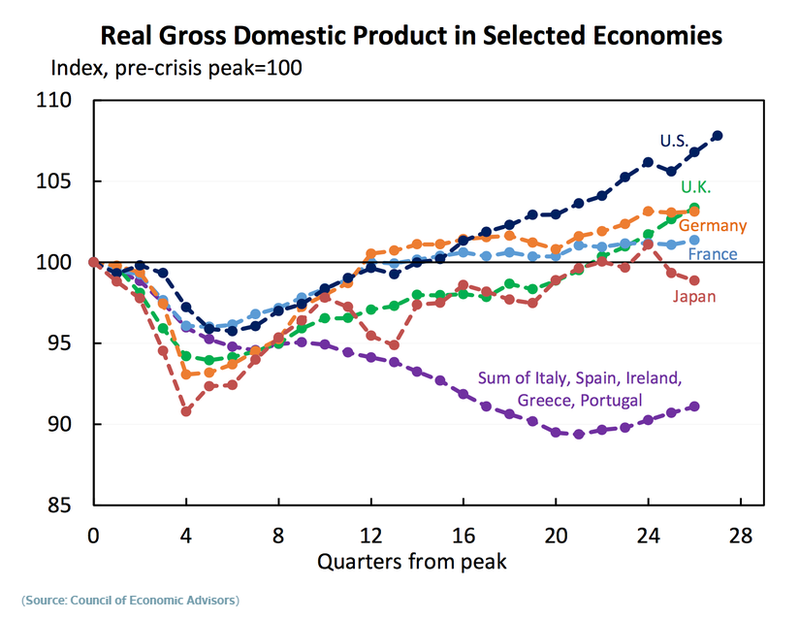 This is where Euro-zone watchers point to problems in countries such as Italy, Spain, and Greece. 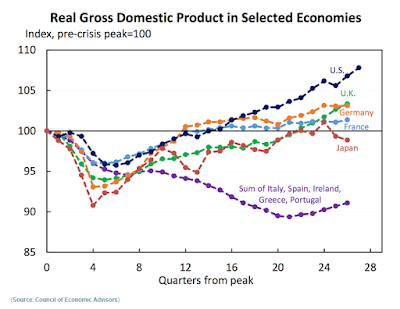 The fact is that for all the stimulus thrown at it overall euro-zone growth remains not so good. Many of the issues never addressed continue to haunt these economies while Germany's growth has been pushed front and center in an effort to mask the desperation growing across a broad swath of the region. This has become more complicated with the threat of a global trade war now hanging over Europe’s export-oriented economy. Dishing out many of the usual lines he has used in the past the President of the European Central Bank Mario Draghi played down concerns over softness in the Euro-zone economy. During a press conference, Draghi argued the economy of the 19-country currency block remained strong but acknowledged evidence of a “pull-back” from the exceptional growth readings it had previously experienced around the turn of the year. As the ECB moved to bolster expectations for a gradual withdrawal of the ECB’s monetary stimulus. It seemed clear the ECB did not want to upset investor expectations that its 2.55 trillion-euro ($3.09 trillion) stimulus program would end this year and its policy rate would rise for the first time since 2011 towards the middle of next year. While the US and the UK were mired in political chaos during 2017 the EU was busy claiming it was experiencing improved economic conditions. This did not move them in the direction of implementing long-needed EU and eurozone reforms but merely fueled the complacency that has haunted the region for so long and set the stage for another crisis down the road. How can anyone claim the situation is under control when a story in Reuters in the middle of last year claimed officials in Europe actually thought telling the public that they will not have access to their funds, even funds covered by official deposit insurance was somehow helpful to addressing Europe’s troubled banking system. This is a reminder to anyone thinking that Europe is anywhere close to adopting an effective approach to dealing with failing banks may want to think again. The policy that has been in the works for some time was floated out for a reaction less than two months after a run on deposits at Banco Popular contributed to the collapse of the Spanish lender. Judging by the continued reaction by investors and on social media, it appears that the EU has learned nothing about managing public confidence when it comes to the banking sector. That could be why even today the European Central Bank, as expected, left interest rates unchanged saying it would continue its program of asset purchases through September, "or beyond, if necessary." The banking issue circles back around and infecting and poisoning how money flows within the Euro-zone. It is only logical that wealth would flee the weaker countries and seek refuge where banks are thought to be at least stronger if not solvent. This has become an increasingly dangerous game as EU officials talk publicly about getting tough on insolvent banks and even suspending access to funds for retail depositors while countries are more or less forced to continue bailing out troubled banks and large creditors in a display of cronyism and business as usual. The ugly choice is to let the bank fail which would unleash a wave of bank runs that would spread into total chaos. Contrast the EU proposal with standard practice in the US, where the Federal Deposit Insurance Corporation (“FDIC”) begins to market troubled banks before they fail. Bank closures and sales usually occur on a Friday with the branches of the failed bank opening on the following business day as part of a solvent institution without any interruption in customer access to funds. All this feeds into and creates a strong argument that nothing is really better or has been fixed in the Euro-zone and that the area continues on life support. The fact is the ECB is trapped in a box of its own making or why else would it leave its refinancing rate at 0%, the rate paid on deposits parked overnight at the bank at negative 0.4% and the rate on the deposit facility at 0.25%. While some Wall Street analysts started encouraging investors to jump into EU bank stocks last year, the fact is that there remains nearly €1 trillion in bad loans within the European banking system. This represents around 6.5% of the EU economy. 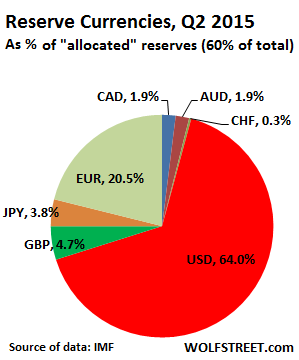 That compares with non-performing loans (NPL) ratios in the US of 1.7 percent and 1.6 percent of gross domestic product in Japan. Circling back to the issue of the banking sector and public faith in these institutions, the idea that the banking public would ever be denied access to cash virtually ensures that deposit runs and wider contagion will occur in Europe next time a depository institution gets into trouble. The US learned the hard way in the 1930s and again with the S&L crisis in the 1980s, the lack of a robust national deposit insurance function to protect retail depositors leaves an entire society vulnerable to banks runs and debt deflation. 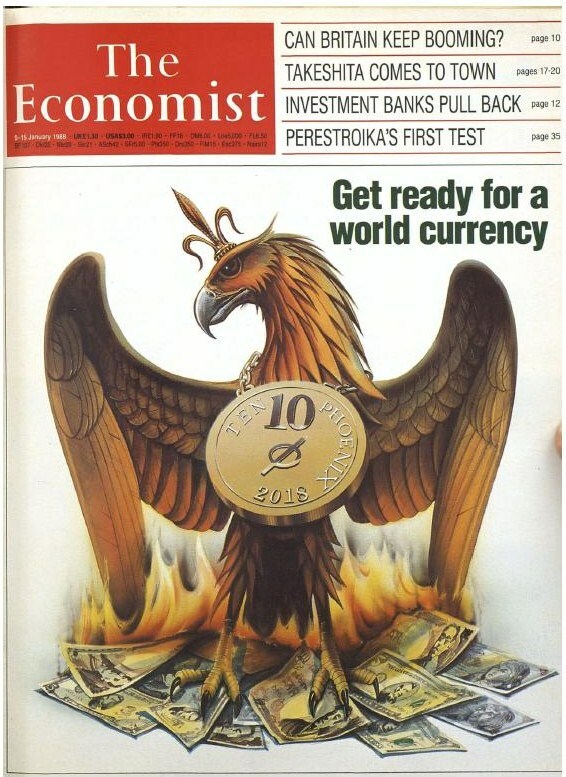 Unfortunately, much of the problem is rooted in the fact the euro itself was constructed on a weak and flawed foundation. Any currency joining and binding states or countries together must allow for an adjustment to send back funds to its weakest part or eventually it will become so unbalanced it will fail. The United States does this by collecting taxes on a federal level and sending back money and aid to areas that are economically weak and need help. In the same way, the EU has still refused to deal with Greece’s mounting debt it cannot seem to accept that protecting the small depositors of European banks is the price to be paid for preserving social order and even the euro itself. The bottom-line was revealed in Draghi's comment: "An ample degree of monetary stimulus remains necessary." This most likely means the euro will suffer more pain going forward. Senate Votes "Any Distraction From Business As Good!" 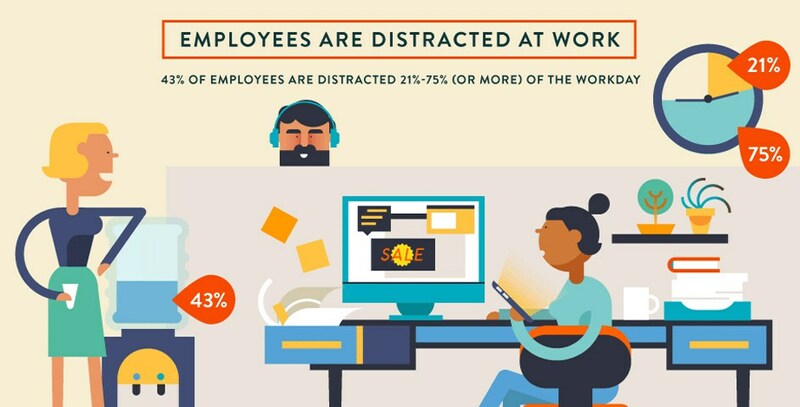 A sign of the times is that any distraction from business is a good one. Cost be damned! Those advocating this "anything goes" attitude and who are telling management to "to get over it" have forgotten the importance of being focused on a task. This article was motivated in reaction to Sen. Tammy Duckworth (D-Ill.) saying recently that she is working with Democratic leadership to change Senate rules in order to allow her to bring her baby onto the Senate floor. In an interview with CNN, she said the rules governing children brought onto the floor in the Senate are "outdated" and reflect a time before women, especially mothers, could be senators. True to her pledge Duckworth who is the first senator to give birth while in office later this year has put this issue before what is important to many Americans and moved it up the list of priorities. "For me to find out that there are issues with the United States Senate's rules where I may not be able to vote or bring my child onto the floor of the Senate when I need to vote because we ban children from the floor, I thought, 'Wow, I feel like I'm living in the 19th century instead of the 21st, and we need to make some of these changes,'" the Illinois Democrat told CNN. "I mean, this is ridiculous. We're in 2018 and we're still dealing with this in the United States of America. We're better than that. And, certainly, this speaks to the problems we have in this country with the need for family leave and certainly more family-friendly legislation in this country." An Almost Giddy Sen. Duckworth Makes It About Her! Duckworth went on to say that Democratic leaders in the Senate have been supportive of her effort to request an official rules change to allow any senator to bring a child onto the Senate floor within the first year of the child's life. Well, it has come to pass, Sen. Tammy Duckworth’s newborn daughter, Maile Pearl Bowlsbey, has become the first baby to get Senate floor privileges. With unusual speed and in rare bipartisanship, the Senate unanimously approved the resolution crafted by Duckworth, to allow toddlers under the age of one on the floor during votes. It should be noted you only get this kind of unanimously approval or vote is when the Senate is in full pander mode. While many people might think my reacting with angst is an overreaction I would like to argue that this continues to set the tone that any distraction from business is a good one or at least acceptable. This is not an attack on women or new parents, animal lovers or people that love to talk on the phone, it is about work and focusing on the job at hand. This attitude that bringing your personal life into the workplace is acceptable has become all to commonplace throughout society in recent years. Articles and news stories about people taking their pets to work almost screams out and encourages other workers to ask for or even demand such a right. An article in USA Today was quick to point out that, according to a Virginia Commonwealth University study, employees who bring their dogs to work produced lower levels of the stress-causing hormone cortisol. This claim of a calming effect might be presented for any action that would allow a worker to kick it down a notch or two whether it is a longer break, midday naps, the right to do online shopping from the office computers or unlimited cellphone use. The study sited above was conducted by Randolph Barker, a professor of management, and covered a dinnerware company in North Carolina, which sees 20 to 30 dogs a day on its premises. As the workday went on, the research found average stress level scores fell about 11% among workers who had brought their dogs to work, while they increased 70% for those who did not. While the numbers may be considered questionable according to a 2008 national poll of working Americans 18 and older by the American Pet Products Manufacturers Association, 17% reported their company permits pets at work. In this post, I'm using the terms "business and work" as somewhat interchangeable. Work is defined as; activity involving mental or physical effort done in order to achieve a purpose or result. "he was tired after a day's work in the fields"
synonyms: labor · toil · exertion · effort · slog · drudgery · the sweat of one's brow. Yes, this means that sometimes it is dirty and sometimes it is difficult and often work is not always fun. That might be why they call it work! When someone takes a job and accepts doing the work it entails that take on a responsibility to those they are working for. In the case of the United States Senate, they are supposed to be working for the American people at no small cost to taxpayers. When it comes down to responsibility sometimes life is not all about "touchy-feely" but actually getting the job done and getting it right. Sadly, most polls show the Senate and most of the people we have sent to Washington at great expense has failed to accomplish the job they have taken it upon themselves to perform. Until they are able to improve their job performance it might be best if they avoid distractions and encourage others to do the same. Computer generated models and images have advanced to where they blur reality and diminish the need for humans to act as spokespeople or to represent organizations. Back in 2011 Swedish fashion chain H&M admitted to using computer-generated models to showcase collections on its website. Since that time the ability to create computer generated images has only gotten better. We have advanced to where it is difficult, no, it would be more accurate to say impossible to always know if what you are seeing is really a person or simply the image of one. Drilling down into this issue forces us to where creativity, marketing, and price-point intersect and that has huge implications for society going forward. This brings front and center the question of what to believe in a world of fake news and false flags where what we create is limited only by our imagination. "It's not a real body, it is completely virtual and made by the computer. We take pictures of the clothes on a doll that stands in the shop, and then create the human appearance with a program on a computer." Andersson argued the company made the choice to use the images of computer-generated models because it simplified the process of the photoshoot and also that it allowed customers to focus on the clothes rather than the models. He acknowledged, "The result is strange to look at, but the message is clear: buy our clothes, not our models." Computer-generated imagery, more commonly known as CGI, encompasses the tricks and the ability to generate and manipulate images. This creates some interesting possibilities going forward as well as greasing an already slippery slope with endless possibilities. Eventually, this could lead to a form of "Photoshop" on steroids. Anyone familiar with Photoshop knows it delivers the magic that helps people bring their creative vision to life. By editing raw image files and photos by using state-of-the-art photo editing not only can people create compelling high-dynamic-range images (HDRI) that can be used for a variety of purposes but can also mislead viewers as to what is real. It appears this is just the beginning, by adding distinct characteristics from individuals that society views in a very positive light to a CGI it is not difficult to imagine that we might extend some of that same positive feeling to that image. If this is true then it is not difficult to envision both politicians and others "scrubbing" their voice and persona ever so slightly as to improve the impact they have on advancing their cause. Slowing their speech, deepening the tone of their voice, shaving off a few unwanted pounds. Manipulating people in this way could be looked at as a form of propaganda but in reality, it is only one step farther than we already go when we do extreme editing of a news clip to sway public opinion. The future of TV news could be very different in that it could be completely computer-generated. Take for instance, the many imitation sounds engineered into some electronic keyboards today. While an audiophile may be able to tell the difference the average listener can not and most people don't care if it results in a less expensive download for their iPod. Since the same thing can be said about music and even art this can be scary, especially if you are the person suddenly discovering that a robot could take your job. In Vegas, stage shows used to all have live orchestras but now many musicians have a difficult time finding work on the strip. We have also seen the electronic equivalent of human-generated music gain a foothold as a genre and become a market all its own. Voice actors are already feeling the heat as the encroachment of synthetic voices hit the industrial/corporate market and push into audiobooks. The ability to produce a human-sounding voice with all the inflections, nuances, and timing that makes it interesting often requires as much technical artistry from a software engineer as it does from an experienced voice actor, however, at some point computers will be able to take over and perform this task as routine. This should not come as a surprise to anyone who has been watching recent trends in technology. A quick search for the words "voiceover" and "computer voice" will bring you rapidly up to speed. Apple has even designed into its iPhone a feature called voiceover which the visually impaired find very valuable, it reads the words on the screen out loud in what Apple calls a "spoken English interface." 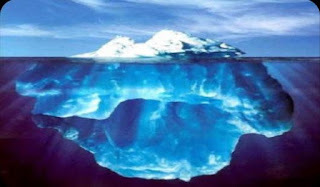 Keep in mind much of this is increasingly happening beneath the surface in places we seldom see. The fact is we now have computers that sound more human than humans and on a positive note speak more clearly. It is not difficult imagining such figures saving media networks money by delivering the news. All this takes us to a time in the future when computers have the ability to generate images that deliver dialog and can act with emotion. By mimicking figures of the past or their best qualities and traits it would be possible to create false figures with compelling personalities. Sadly, the future may be a place where knowing what is real and what is a false may become difficult to determine and perceive. This makes this sometimes deceptive and potentially dangerous area of technology ripe for abuse. Footnote; In life most people never meet or hear their Senator or President speak in person, this means a "gentle concealed" enhancement could go a long way to make them appear more appealing. It is important to consider that if this technology can be used to enhance the stature of a person it could also be used to diminish their standing or even as a tool for character assassination. 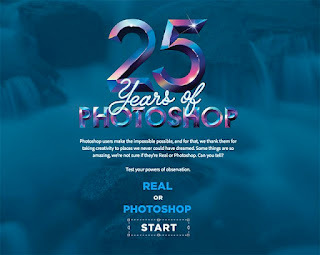 Footnote #2; If you did not hit the "Click here to take the test" line under the image of 25 Years Of Photoshop it is a highly recommended exercise. I felt it was time to write something a little off-beat so I decided to write about the lowly penny and what is it really worth. 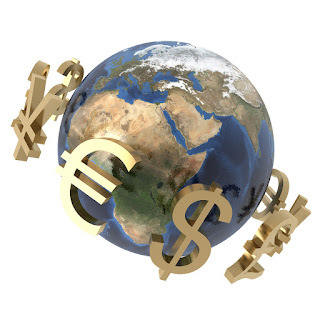 Currency should be designed by the government as a simple and efficient medium for exchanging goods and services. In March of 2012 Canada made the decision to do away with its puny penny coin, loved by some but an annoyance to many, it was withdrawn from circulation because it costs too much to make and had become a pecuniary pest. Ottawa said the penny retained only one-twentieth of its original purchasing power. Because it costs 1.6 cents to produce each one cent coin stamped out discontinuing the penny was expected to save around $11 million a year. To many people the penny has is simply a horrible little thing with no redeeming value. A blemish on the face of America, costly to produce, no friend to the environment, wasting America’s resources while sapping our productivity. It cost our country billions of dollars, year after year, this amount of waste adds up over time. Still, we find that not only does the government continue making the penny but over the years it has even made new versions of the penny. Voters need to remind Washington that it is not the job of the well-paid employees of the treasury to create collectibles or to pander to small segments of the population by designing coins commemorating or recognizing minor events. Coins are designed by the government to be a simple and efficient medium for the exchange of goods and services. For many years there have been discussions about discontinuing the penny which has become obsolete because of its minuscule purchasing value. The penny is a perfect example of our government's inefficiency and waste, and the cost is a burden carried by business. If an employee is paid $12.00 an hour they receive twenty cents per minute. Business simply cannot afford to pay an employee to handle and count pennies, the cost of the labor exceeds their value. According to the “citizens to retire the penny” it cost the Country one hundred million dollars a year to produce the penny, and more then $15 billion dollars annually is wasted just in handling it. The debate against continuing the penny is overwhelming, anyone still supporting it most likely has not given the subject much thought or is simply resistant to change, “the penny doesn't make sense" From an environmental standpoint the penny is also a disaster when you consider all the energy used to make, transport, and distribute this useless coin. 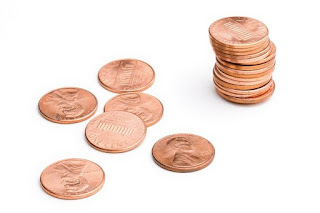 Currently, it costs the U.S. Mint 1.66 cents to make each one-cent coins, meaning that taxpayers are losing 0.66 of a cent for each one of the 9.1 billion pennies the Mint produces each year. That is a loss of $60,181,440 to produce pennies in 2016. 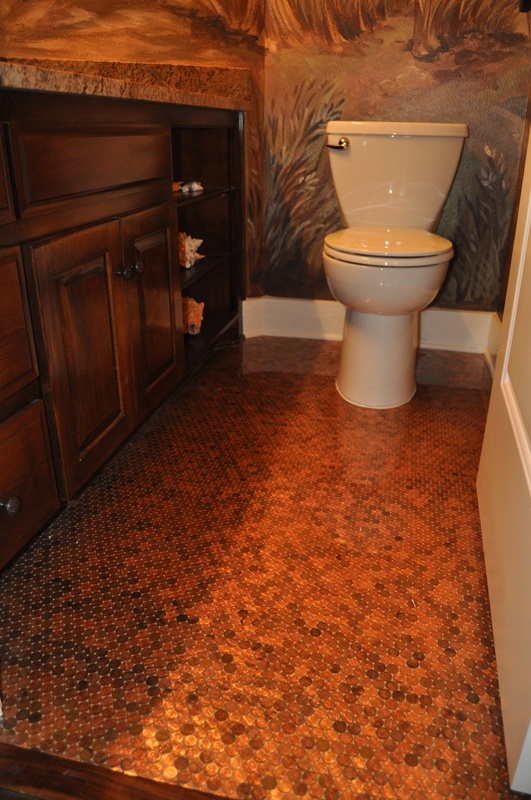 The U.S. Mint makes an average of 21 million pennies per day which adds up to around nine billion pennies annually. If we just get rid of the penny, the U.S. Mint would cut its work in half. This figure does not include the time, fuel, expense, and hassle of carting all of those pennies around to the banks, merchants, etc. Footnote; Please feel free to reprint this article and share it with friends and others, thanks. America Did Not Vote For More Death And Destruction! Stockman, who served as a Republican U.S. Representative from the state of Michigan and as the Director of the Office of Management and Budget under President Ronald Reagan, contends that President Trump has become a hostage of those occupying the very swamp he promised to drain. This is how Stockman explains many of the actions that have dismayed the many of us who voted for Trump partly because he did not come across as a warmonger during the presidential campaign. If Stockman is right it could be that the power of the swamp is too strong and simply cannot be drained. Concrete Visual Proof Of Iran's Aggression! Trump recently brought John Bolton into his inner circle as his next national security adviser, in some ways this is the very antithesis of America First and the policy of anti-interventionism. Bolton is an emissary for what might be considered the wing of the Republican Party that views war as a major tool and a satisfactory way of achieving foreign policy. This extends to demonizing Iran and acting to glue together a coalition of rightwing groups that want out of the agreement with Iran that lifted crippling economic sanctions on Iran in return for limitations to the country's controversial nuclear energy programme and efforts to create a nuclear weapon. 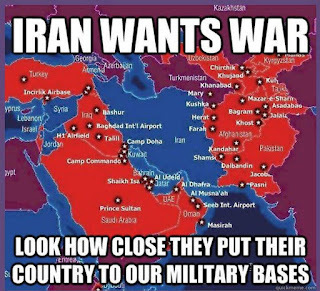 Ironically if the deal is not broken and Iran sticks to the bargain in many ways it will show the entire world the almost four-decade-long demonization campaign that has been conducted against Iran by the neocons in Washington and Israel has been nothing more than fabricated lies. Clearly, spinning angst against Iran has been very beneficial to those seeking both power and money to counter Iran ever being able to acquire a nuclear bomb. 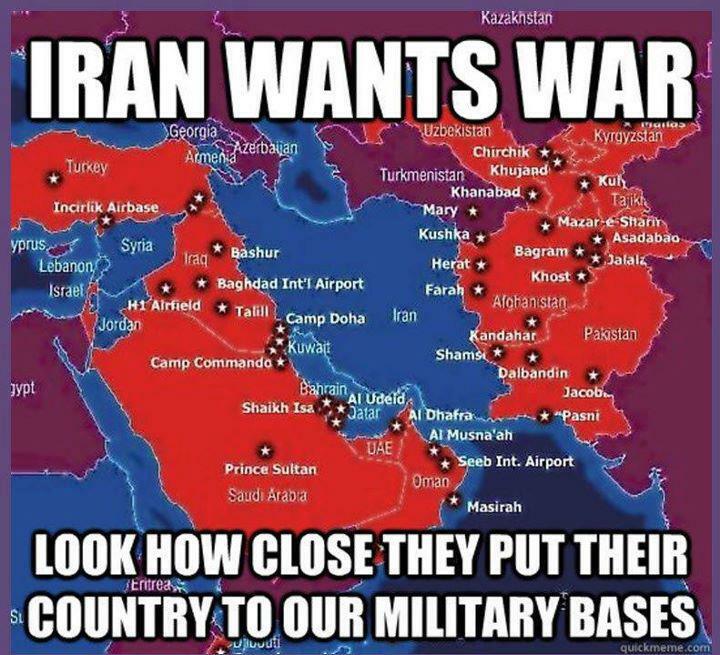 By hyping the threat of Iran to America and all of the Middle East many of the same people that originally opposed Trump and have gone to such great effort to bring Trump under control appear to be much more aligned. The article you are currently reading is actually a "twofer" or two drafts that I had started rolled into one. It pulls together two different thoughts or topics, "Silly Us We Thought We Were Voting For Something Else" and the idea that, "When Your Country Goes To War Your Opinion Does Not Matter." After studying history it becomes obvious that countries are drawn or march into war for many reasons, however, as a nation moves towards war that does not mean many or most of that country's citizens are all that enthusiastic. Even as institutions begin to go through the ritual of preparing them for what lies ahead this does not mean the average person will endorse military action. Throughout history, we find that institutions have traditionally done the heavy lifting when a government signals that war is on the horizon. These are generally the institutions we have come to refer and describe as the "Deep State." 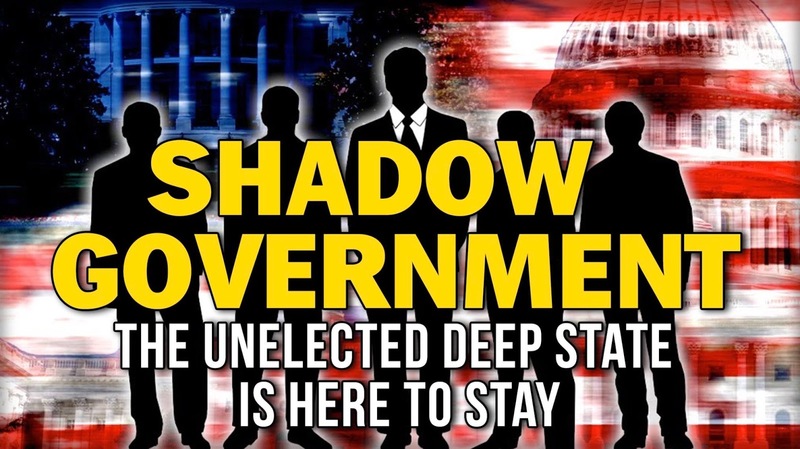 The term was originally used to refer to sophisticated shadow governments in less transparent countries and when related to America was considered a conspiracy theory. Those touting its existence see it as a coordinated effort by career government employees to influence state policy without regard for democratically elected leadership. 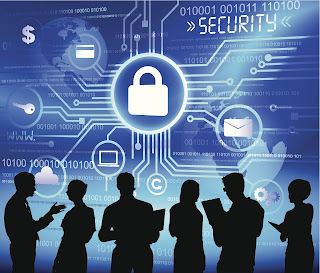 This would include many of the most powerful men of the last several decades that still retain the influence and power to command the armies of armed agents and have the ability to target, bug and wiretap almost anyone. This gives them virtually unlimited power to influence government regardless of who is formally in power. 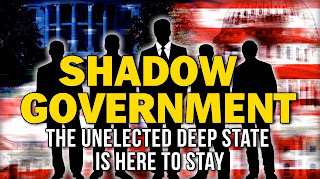 Shadow governments are the legacy of the bureaucracies formed as part of the top secret inner-workings of military and spy agencies dating back to the end of World War II. These are an expansion of what President Dwight Eisenhower deemed the “military-industrial complex” and extend into influencing and controlling the media in what they call the national interest. This all circles back around to the current warmongering that has captured Washington and turned us into pawns in a high stake game where a miscalculation could release a wave of nuclear missiles into the sky. We should question if those who stand to benefit have designed all this thirst for blood as a giant con or trick to blind us to reality. A ploy to glorify their militaristic actions bolstered by the gullibility of those local and family historians who provide stories with a kind of “band of brothers” nostalgia that neatly repackages or camouflages ugly and brutal death with heroism. The fact is few soldiers and innocent civilians rush to sacrifice themselves but are sacrificed by the state. The fact that in the charged political atmosphere of today we would take our moral cues from a gang of former intelligence officials is an indication the problems of our society run far deeper than we can imagine. With the threat of impeachment always lurking in the background we should remember the Washington insiders have never been Trump's friend and would love to see him fall to the vengeful furies of the broad witchhunt Robert Mueller is conducting. We should also remember many of the people the President has allowed into his circle are the residents of the very same swamp he campaigned against. The line of the day should be "Been there, done that, learned nothing!" Footnote; The links below lead to articles related to the post above. The future of China is intricately interwoven with its far-reaching and encompassing One Belt One Road (OBOR) initiative. The program of monumental scope was launched in a fanfare of state-media publicity by Xi in 2013, this colossal program has become an extension of Beijing’s global ambitions and the centerpiece of its economic foreign policy. 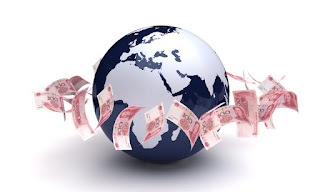 Recently while in China International Monetary Fund Managing Director, Christine Lagarde warned of the potential risks involved in Xi’s grand global vision. The key issue or risk has to do with increasing China's debt by agreeing to loans which could prove economically explosive. The many people enthusiastic about China's bright future should not forget the country faces several huge challenges. It was recently announced that President Xi Jinping has somewhat unexpectedly picked PBOC deputy governor Yi Gang to run China's central bank. Yi has a formable task before him as he shapes a response to the three or more rate hikes expected from America's Federal Reserve while moving forward on Xi’s financial cleanup and deleveraging campaign. This will have to be done at the same time China attempts to keep inflation from rising and resolve trade issues with President Trump. One thing is certain that all this will be interesting to watch as it unfolds and so will the issue of whether Xi and his global partners can avoid falling into the age-old debt trap. Will OBOR Become A Bridge To Nowhere? It is important to think that in some ways the whole concept of OBOR could be described as an extension of the "If We Build It They Will Come" theory. 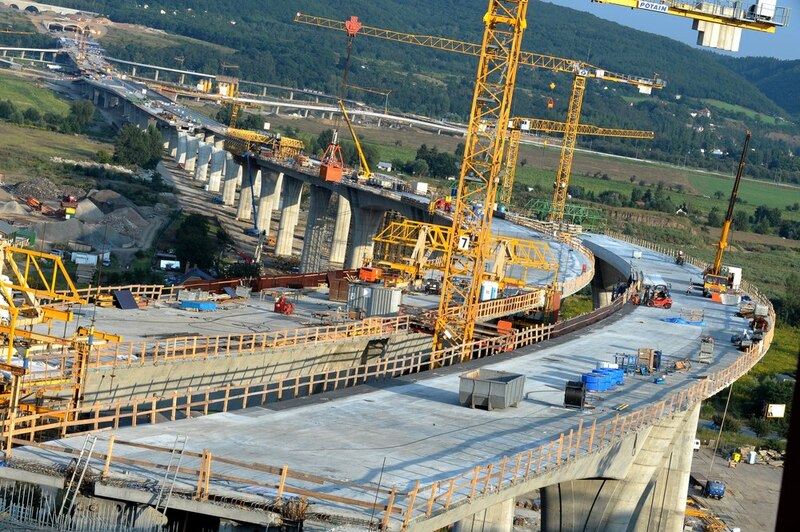 Many times in the past governments have used the idea that building out infrastructure will create growth and prosperity to move their economy forward. 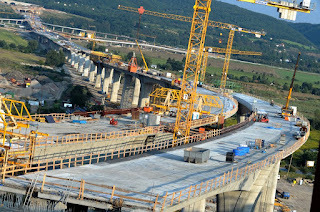 The thought is these projects will pay for themselves many times over and constitute a win-win scenario leaving those promoting them as heroes, however, history is littered with failed government projects. These so-called, "bridges to nowhere" and boondoggles tend to be forgotten and brushed aside each time public servants and their cronies get together. In America they are now often known as "Public-Private Partnerships" in a country like China they could be viewed as just another form of corruption. China is faced with pushing forward and financing OBOR with its economy having a huge debt/GDP ratio already well above 300% according to the Institute of International Finance. While Lagarde touched on these concerns when highlighting the broader issues, she also made it clear that Beijing was fully “aware” of the potential potholes dotted around such a massive undertaking as OBOR and underwriting its funding. The cost of the planned network connecting China with 68 countries and 4.4 billion people across Asia, Africa, the Middle East and Europe in a labyrinth of multi-trillion-dollar transportation, energy, and telecommunications infrastructure projects may total as much as 8 trillion U.S. dollars. The Center for Global Development, a Washington-based think tank, has highlighted in a report entitled Examining the Debt Implications of the Belt and Road Initiative from a Policy Perspective, the underlined the problems of extending credit to poor or unstable countries. It has pointed out that as many as 23 countries could be prone to “debt distress.” This group includes Pakistan, Djibouti, the Maldives, Laos, Mongolia, Montenegro, Tajikistan and Kyrgyzstan which were rated in the “high risk” category. Past high-profile horror stories associated with China’s overseas ventures add to overall concern and the fact Pakistan was flagged in the report as “by far the largest country at high risk” is sobering. The real question is whether OBOR will become a massive expensive bridge to nowhere? Footnote; Links below are to articles related to this topic. Putin is slated to start a new six-year term after 18 years in power. This comes at a time of sharply deteriorating relations with a number of Western adversaries, who accuse him of military adventurism in Ukraine and Syria and hostile attacks on several countries ranging from election meddling, cyber attacks, and assassinations. Putin’s foreign policy, coupled with efforts to rebuild the Russian military, have been part of an effort by the 65-year-old former KGB officer to boost Russia's standing on the world stage has helped make him extremely popular with his people even as Nato has slowly been expanding in the direction of Russia. Several years ago I wrote a piece that urged America to stay out of a war in Ukraine. It also warned of the major advantage Putin held by having a huge well-armed army just across the Ukrainian border and that any army cobbled together to face him would most likely be unenthusiastic and politically troubled at best. At the time President Obama had pulled out all the stops to paint Putin with a brush dipped in all the bad colors. Every Sunday in interview after interview Washington experts were paraded across the screens of the talk shows that tell Americans what is happening in our nation's capital and every single one of them denounced Putin as a "thug and a bully." Ironically, just three years later we find that Russian President Vladimir Putin has just won re-election by a wide margin on Sunday with around 76% of the vote. This strengthens his hand and means the only thing that has really changed is Obama is gone and been replaced by Donald Trump. Who would have predicted that? The reports from the front in Ukraine are often buried or hidden from public view but they appear to confirm that Ukrainian troops have been sent into a meat grinder. The drafted include men up to 60 years old with only a month of training before they reluctantly go off to the battlefield in eastern Ukraine. Putting more weapons into the hands of those unmotivated to fight for their corrupt state is merely adding fuel to this fire and doing more harm than good. Again, remember Ukraine is a financially failed state and while we can point to its potential, its massive oil and gas reserves by all rights should belong to the people and for their benefit. The IMF, however, points out that Kiev needs billion in loans and grants just to stabilize its economy after more than twenty years of massive levels of corruption. This debt and the deep, deep hole Ukrainians have dug themselves into flows from a series of bad governments after Kiev became independent of the Soviet Union. 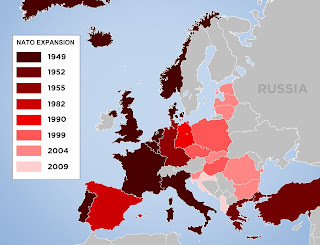 The euro-zone currently faces a lot of problems without jumping into a proxy war against rebels in Ukraine. I use the term proxy because without the money and backing of outsiders things would most likely go quiet. The failed and bankrupt country of Ukraine would most likely break into two parts with the eastern half and its people who share strong ties with Russia aligning itself with that country and Kiev, and the western-oriented portion of the country drifting towards stronger ties to the euro-zone. What is the big problem with such a solution? Apparently, a great deal if you ask those in Washington that are pushing for more intervention in Ukraine. As to what really motivates their desire to turn the area into a giant killing field several possibilities exist but money and profit should not be ruled out. War In Ukraine Is About Money, Energy, And Power! Foreign policy has often been used as a tool to advance national interest which is often dictated by economics. When it comes to the economy energy is often considered the blood from which all strength flows and in the case of Europe the Nord Stream 2 (NS2) pipeline which after completion will carry natural gas from Russia to Germany is a bone of contention. On March 11, leaders from Poland, Latvia, and Lithuania signed an open letter to the parliaments of the EU states warning them against the construction of NS2 and cautioned them of how it is not a commercial project but one designed to increase their energy reliance on Moscow. Last year, Russia's Gazprom supplied the European Union and Turkey with a record 162 billion cubic meters of gas. Of that gas, 86 billion cubic meters flowed across Ukraine. Those opposed to the new pipeline make a strong case that "Gazprom" is not only a gas company but a platform for Russian coercion and another tool for Russia to pressure European countries. The U.S. State Department has even threatened European corporations that they will likely face penalties if they participate in the construction of Russia's Nord Stream 2 gas pipeline, on the grounds that "the project undermines energy security in Europe". Under a provision in the Countering America's Adversaries Through Sanctions Act (CAATSA), Washington has indicated it may turn up the pressure to stop the project. 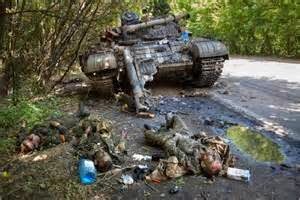 To confuse the issue and muddy the waters great efforts have been made at high levels by those advocating military action to paint Russia as an aggressor. These forces continue at a rapid pace to link Russias move into the majority ethnic-Russian Crimea region as a violation of Ukraine's sovereign border. In this case, we should remember, the whole concept of sovereign borders is a little gem promoted by those in power, these borders are a creation of man and not visible to the birds flying above. This is an argument of convenience that masks deeper issues and the difference between "terrorist" and "freedom fighters" often depends on a person's point of view. In this case, it is clearly the new American backed government in Kiev that is pushing to bring the eastern part of Ukraine back into the fold. What this boils down to is that American companies want to sell and supply Europe with Liquid Natural Gas (LNG) and seems willing to start a war to make it happen. 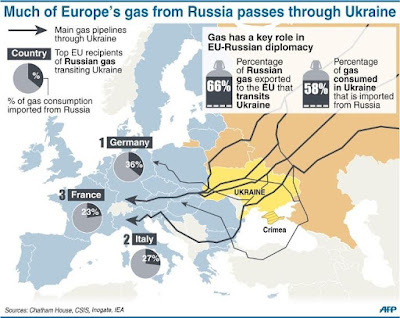 Whether it is for profit or to minimize the threat of natural gas shipments to Europe being cutoff and used as a key weapon in Russia’s political arsenal we cannot ignore the idea more is at play here than just doing the "right thing". Many people in the "Tin Foil Hat" community have gone so far as to indicate they feel that America and elements of the CIA were involved or had a part in the overthrow of the former corrupt Ukraine government and its replacement with another corrupt but more pro Europe regime. At the time even America's Vice President, Joe Biden, saw his son join the board of a private Ukrainian oil and natural gas company. One thing is clear, not only those involved in selling energy to Europe will profit from this but also the military-industrial complex stands to gain. The odds of U.S. LNG significantly displacing Russian natural gas shipped by pipeline are slim. Piped gas sells at a large discount to LNG, which must be cooled to liquid form, shipped overseas and turned back into its gaseous form. Poland recently received its first shipment of U.S. LNG last month from what is currently the only export facility in the lower 48 states. While LNG trade between the United States and Europe would help Trump in his bid to reduce the U.S. trade deficit it also stands to improve energy security among the European countries by giving them an alternative to Russian gas. Everyone must concede it is not a cure-all, Russia can easily cut prices and adjust terms to maintain its dominant position in the European gas market and European countries are likely to continue buying most of their gas from the lowest cost supplier. Bottom-line, Russia has traditionally been the major supplier of European gas. But it charges high prices, often in the form of long-term contracts linked to the price of oil. The overwhelming dependence on Russian gas leaves European countries from a national security standpoint vulnerable to a cutoff of crucial natural gas supplies. This would be devastating to their economies at any time but even more so in the depths of winter. For these reasons, it makes sense for Europe to consider alternative supplies and open its doors to U.S. LNG but due to Ukraine's history of corruption flooding the country with weapons and using the people of Ukraine as pawns in this high stakes game violates all standards of human decency. Americans should also be aware that our current policy drives Russia towards the East and into the open arms of China. This creates even more problems long-term than it solves short-term and borders on the edge of insanity. The war in Ukraine has not developed organically but appears to be the product of meddling. Mercenaries and money from America appear to be backing and propping up Kiev with America acting as the "champion" for this failed bankrupt country. The best way for the West and Kiev to prove they are on the right path is by letting the eastern part of the country seceded and then making Kiev a center of economic and democratic success. Database To Monitor Journalists, Bloggers, And More! It seems the Department of Homeland Security wants to create a database to monitor journalists, bloggers, and social media influencers should concern all Americans and not just those who might be put on the list. According to the DHS’s statement of work.DHS seeking a contractor for a “media monitoring services” project. The job entails creating a searchable database that has the ability to track about 290,000 news sources, both foreign and domestic. Consider this as more proof that security comes in many forms. The Chicago Sun-Times reported the plan comes amid concerns of so-called “fake news” and its effect on U.S. elections. Considering President Trump’s aggressive rhetoric against the mainstream news many in the media industry see such a database as yet another attack on the free press. Another possibility is that it may be simply the deep state continuing its unchecked expansion deeper into society. 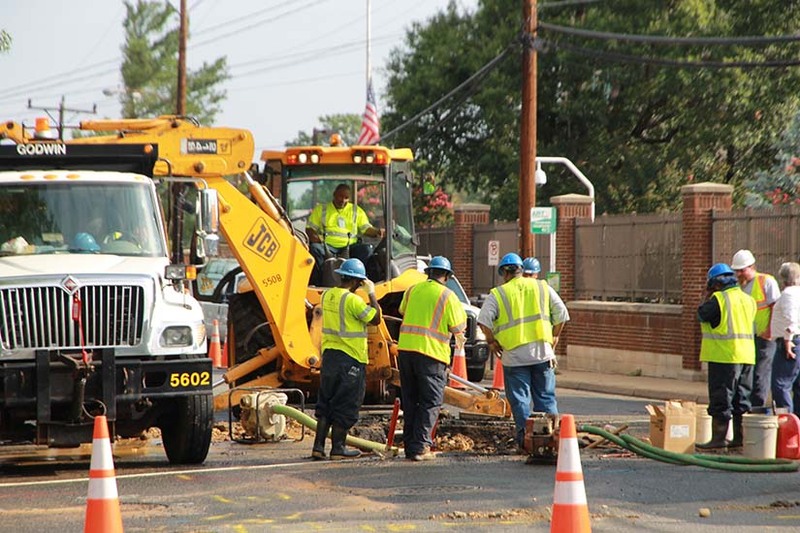 The DHS solicitation for bids on the project can be viewed on the website FedBizOpps.gov. Regardless of why the DHS thinks they need such a database the three things we can be certain of is that it will be costly, taxpayers and their children will foot the bill, and last but not least, the money will line the pockets of Washington insiders. In this "Clash Of The Titans," a feisty President with low approval ratings has come out swinging on a company that has rapidly grown and expanded into every part of the economy and our lives. 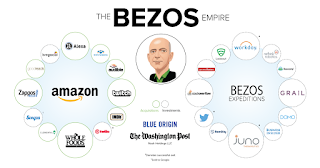 Bezos Inc. which is comprised of more parts than most people imagine usually sports the face of Amazon, Amazon Web Services or AWS, Whole foods, and the Washington Post. To really understand this clash it is important to understand not only the nature of the beast but who or what they represent. Trump, in this case, has taken the stand that making America great again includes keeping the Bezos empire in check, and many Americans agree that he has a point. I expect that if the subject of this tweet makes the Sunday morning talk show circuit it will be spun as the President bashing an iconic American business or attacking Jeff Bezos a "well respected" CEO and owner of the Washington Post for articles critical of the Trump administration. According to USA Today, Trump claims that not only does Jeff Bezos, use the Washington Post as a tool to get what he wants out of Washington politics but that Amazon skirts its responsibilities as a taxpayer exploiting the system. While the part of this charge that Amazon is a "tax dodger" may seem hypocritical coming from a man who said paying the least amount of taxes owed made him smart it must be noted he does have a valid point about Amazon's history of exploiting tax loopholes. Fans of Jeff Bezos claim the man is a genius and forward-looking entrepreneur and like many CEO's it is often difficult to separate how we view the man from his company. Amazon and Bezos have many supporters but to me their arguments that what he has created is a force for good often rings hollow forcing me to question their motivation or whether they truly understand business or just how much government policy shapes our society. One thing is certain and that is Jeff Bezos has developed an army of media soldiers ready to not only defend but promote his agenda. Not only does he shape public opinion through the Washington Post, our nations most influential news outlet, he also controls a broad swath of the Internet which allows Amazon to constantly weasel its way into where it is not invited by using a wide array of cross-company promotions. Jeff Bezos did not purchase the Washington Post in 2013 because he expected newspapers to make a lucrative resurgence. He purchased the long-trusted U.S. newspaper for the power it would ensure him in Washington and because it could be wielded as a propaganda mouthpiece to extend his ability to both shape and control public opinion. This is why so many news articles over the last several years concerning Amazon read like an advertisement. The following two excerpts are examples of the kinds of articles Bezos' army of media soldiers constantly crank out. These people are not only ready to defend his agenda but promote it as well, whether the writers pouring out the following articles are soldiers, pawns, or true believers, I don't know. Clearly, what is apparent though is an agenda or bias, I have underlined some of what I thought was over the top. 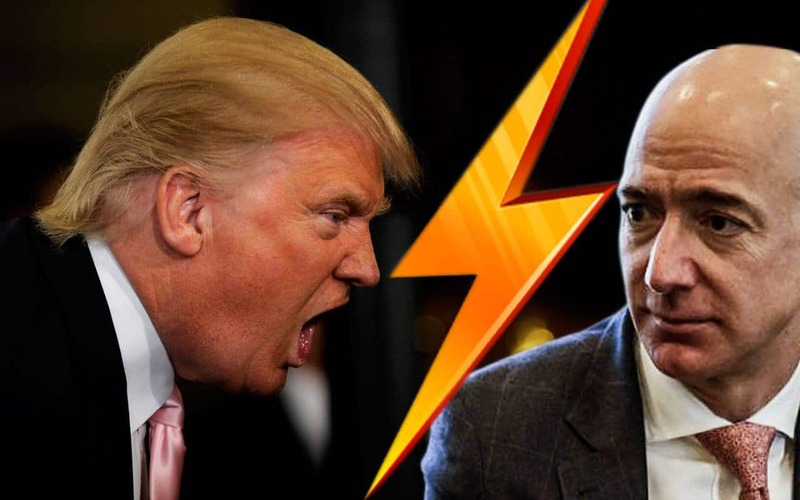 Trump picked a fight with Jeff Bezos today with a highly erroneous tweet apparently intended to strike back at the Bezos-owned Washington Post's coverage of his administration. The digital nastygram suggested Bezos' company Amazon owns the Post (it does not) and that Amazon does not pay internet taxes (which do not exist). One report suggested that Amazon has actually fueled small business growth, mostly in terms of creating new ancillary businesses that support the tech giant. Smaller smart home companies have partnered with Amazon to sync with the Amazon Echo speaker. You can buy products from third-party resellers that might be hard to find otherwise. I've purchased everything from beef jerky to USB-C cables after searching Amazon and seeing a third-party selling exactly what I need, then paying little-to-nothing for the shipping. There's no way I would have found these small companies any other way. 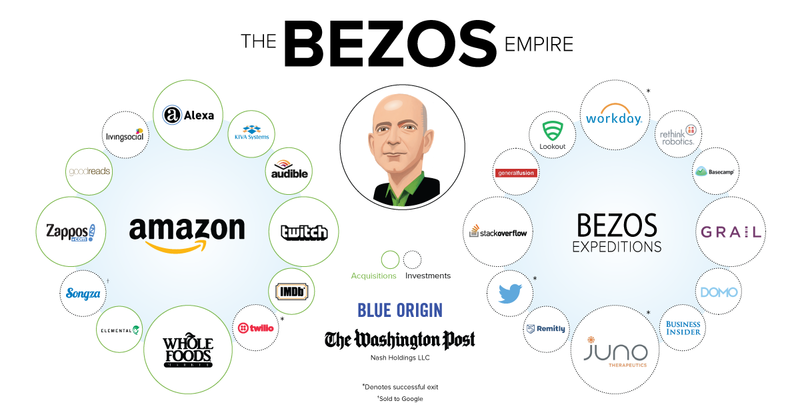 Bezos has been fortunate in being able to leverage the massive amount of money investors have poured into Amazon during the recent easy-money low-interest-rate environment. This has translated into a self-feed loop of rapid growth. The fact is that many of the options Bezos employs to expand Amazon are available to him only because of the many areas his various companies engage in and this is the crux of growing antitrust talk. Antitrust is the part of our economic laws that deal with and relate to legislation against or opposition to trusts or combinations of businesses that create or give an unfair advantage to one competitor over another. This specific area of laws is designed to protect trade and commerce from monopolies that lead to unfair business practices and competition. Few businesses can stand up to the power of a bemouth the size of Amazon when it sets its sights on taking over and dominating their market. All this has been particularly hard on local merchants. Over the years the retail playing field has become very uneven when it comes to brick and mortar versus online vendors. Online retailers pay little and often nothing towards the upkeep and maintenance of local roads and infrastructure over which their goods are delivered. Laws and local enforcement policies do little to alleviate the toll shoplifting has on the profits of stores where customers are free to circulate around the goods being sold. Also, another elephant in the room is that online retailing has caused to develop a strong shadow "return market" where lazy and dishonest consumers bend the rules and buy the identical product at a local store and then return the defective Amazon product as an easy way to short-circuit having to ship an item back. This constitutes a form of theft where wealth is taken from the local merchant and transferred directly to Amazon. It is not by accident that even non-Amazon users and those of us who despise the company find they are constantly seeing the name appear on their computer screen and always being steered in the direction of their shopping site or dragged in the back door. It is rather proof of the company's power to control traffic over the internet. We should wonder how with all the attacks directed towards Facebook and companies like Google the Amazon name seldom is mentioned. With the Post being the most virulently pro-establishment among all large mainstream publications, not just defending establishment narratives but actively attacking anyone who challenges them we should not be surprised the current system protects the hand that feeds it. Current tax laws at the local, state and federal level have changed little over the years and lag far behind how business is conducted in our modern age and this feeds directly into creating an unfair advantage for Amazon which it has used as a foundation to fuel its growth. Still, even more troubling is how the company has created an environment that draws in other sellers of goods then in a predatory manner undercut their ability to compete. When you add these actions with Amazons growing influence in Washington due to its strong relationship and contracts with the CIA and deep state and its ability to drive public opinion through the Washington Post we have every reason for grave concern. Remember the proverbial saying 'power corrupts; absolute power corrupts absolutely'. Footnote; Below is the link to another post that explores Bezos and the Washinton Post and an article I wrote that delves into how Amazon invades every part of our lives.